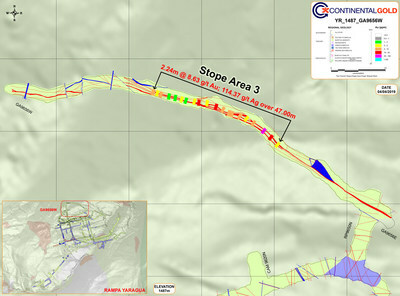 TORONTO, April 15, 2019 /CNW/ - Continental Gold Inc. (TSX:CNL; OTCQX:CGOOF) ("Continental" or the "Company") is pleased to announce high-grade channel sampling assay results from three development drifts where up to five stope areas are being prepared for production as part of the underground construction at its 100%-owned Buriticá project in Antioquia, Colombia. Development of the Buriticá project remains on schedule with first gold pour anticipated in H1 2020. Supporting information for results discussed in this release can be found in Figures 1-3 and all sampling widths reported herein are at horizontal metres. The weighted average gold grade of the development drifts measures 12.89 g/t gold or 53% higher than the proven and probable mineral reserve grade of 8.4 g/t gold for the Buriticá project. 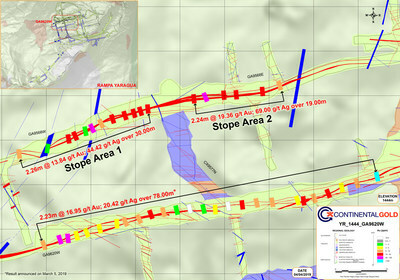 Remarkable continuity and consistent gold-grades were observed in all stope development drifts, with total drift sampling measuring 174 metres strike length. Face channel sampling in the drifts often includes gold mineralization that extends beyond anticipated stope limits, indicating potential for mineralized over-break dilution during extraction. Lateral underground development for the project continues to be ahead of schedule, with 1,068 metres completed in March against 972 metres planned. "Underground development continues to successfully block out areas for mining at the upper elevations of the deposit. Our stope development drifts continue to demonstrate excellent lateral continuity of high-grade gold over significant strike lengths," stated Ari Sussman, CEO. "Underground drifting at the lower elevation where the processing plant is being constructed has finally advanced to the point that we are now starting to develop along modelled high-grade gold domains. We are excited to be opening up the mineralized system at this lower elevation with underground development and are optimistic that we will continue to see robust high-grades of gold along the new development drifts in the coming weeks." Assay results have been received for channel sampling results of three stope development drifts totalling 174 metres strike length. Two of the development drifts are located in the Yaraguá system and the other drift is located in the Veta Sur system. Stopes are being designed within the development drifts to measure between 25 and 45 metres in length using an 18-metre sublevel spacing. Development for this drift in the Yaraguá system has been extended further west in order to lengthen the strike of stope area 2 and results are anticipated in the near term. 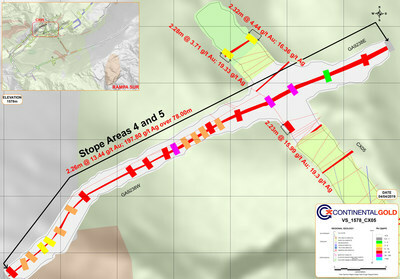 Additional stope drifts at various elevations are currently being developed for both the Yaraguá and Veta Sur systems; once channel sampling assay results are received and evaluated, they will be released in a timely manner. Channel sample results are reported without consideration of modifying factors such as dilution, which are included in the mineral reserve estimate. rate of 2,850. Rounding of some figures may lead to minor discrepancies in totals. 2019 with an effective date of January 30, 2019, led by independent consultants Ivor Jones Pty Ltd.
Continental's 100%-owned, 75,583-hectare project, Buriticá, contains several known areas of high-grade gold and silver mineralization, of base metal carbonate-style ("Stage I") variably overprinted by texturally and chemically distinctive high-grade ("Stage II") mineralization. The two most extensively explored of these areas (the Yaraguá and Veta Sur systems) are central to this land package. The Yaraguá system has been drill-outlined along 1,350 metres of strike and 1,800 vertical metres and partially sampled in underground developments. The Veta Sur system has been drill-outlined along 1,300+ metres of strike and 1,800 vertical metres and has been partially sampled in underground developments. Both systems are characterized by multiple, steeply-dipping veins and broader, more disseminated mineralization and both remain open at depth and along strike, at high grades. Donald Gray, Chief Operating Officer and a Qualified Person for the purpose of Canadian National Instrument 43‑101 ("NI 43‑101"), has prepared or supervised the preparation of, or approved, as applicable, the technical information contained in this release. Channel samples are taken continuously along the walls of the underground cross-cut and across the face of the underground drift. Faces are nominally spaced every 3 metres along the drift, and face composites average six length-weighted channel samples. Widths are horizontal metres at 0 g/t gold cut-off grade and no capping has been applied to sample composites. The Company utilizes a rigorous, industry-standard QA/QC program. Rock samples have been prepared and analyzed at Continental Gold's Yaraguá mine laboratory at Buriticá, Colombia. Blanks, duplicates and certified reference standards are inserted into the sample stream to monitor laboratory performance. Crush rejects and pulps are kept and stored in a secured storage facility for future assay verification. Although historic correlation between analytical results from the Company's internal laboratory and certified independent laboratories for gold and silver analysis have been within acceptable limits, the Company's internal laboratory is not independent or certified under NI 43‑101 and, as such, results in this release should only be taken by the reader as indicative of future potential. Gold equivalent numbers used in this release were calculated at a 75:1 silver to gold ratio at an assumed metallurgical recovery rate of 100%. For information on the Buriticá project, please refer to the technical report, prepared in accordance with NI 43‑101, entitled "NI 43â€�101 Buriticá Mineral Resource 2019â€�01, Antioquia, Colombia" and dated March 18, 2019 with an effective date of January 30, 2019, led by independent consultants Ivor Jones Pty Ltd. The technical report is available on SEDAR at www.sedar.com, on the OTCQX at www.otcmarkets.com and on the Company website at www.continentalgold.com. This press release contains or refers to forward-looking information under Canadian securities legislation—including statements regarding: timing of drill results, first gold pour and commercial production; advancing the Buriticá project; exploration results; potential mineralization; potential development of mine openings; potential improvement of mining dilution grades; reducing start-up risks; and exploration and mine development plans—and is based on current expectations that involve a number of significant business risks and uncertainties. Forward-looking statements are subject to other factors that could cause actual results to differ materially from expected results. Readers should not place undue reliance on forward-looking statements. Factors that could cause actual results to differ materially from any forward-looking statement include, but are not limited to, an inability to advance the Buriticá project to the next level, failure to convert estimated mineral resources to reserves, capital and operating costs varying significantly from estimates, the preliminary nature of metallurgical test results, delays in obtaining or failures to obtain required governmental, environmental or other project approvals, political risks, uncertainties relating to the availability and costs of financing needed in the future, changes in equity markets, inflation, changes in exchange rates, fluctuations in commodity prices, delays in the development of projects and the other risks involved in the mineral exploration and development industry. Specific reference is made to the most recent Annual Information Form on file with Canadian provincial securities regulatory authorities for a discussion of some of the factors underlying forward-looking statements. All the forward-looking statements made in this press release are qualified by these cautionary statements and are made as of the date hereof. The Company assumes no responsibility to update them or revise them to reflect new events or circumstances other than as required by law.